Michael Coonrod will be the soloist with the Traverse Symphony Orchestra this Sunday. He will perform the world premiere of the Concerto for Piano, Left Hand by Kenji Bunch. Michael was a guest co-host during Music at Midday this Thursday. Listen below. 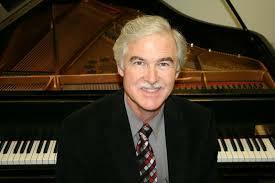 Sunday's concert is conducted by Kevin Rhodes. It also includes Beethoven's Egmont Overture and the Symphony No. 3 "Eroica." Classical IPR's live broadcast starts at 2:50 p.m. with the concert downbeat at 3 p.m. I have been at Interlochen for 43 years. I was actually a camper in 1967, right before my senior year in high school. It means a lot for me to be at one job for my entire life. The recordings [selected for this program] are the fruit of an almost entire lifetime – well, [it’s] not over yet. These are works that I had worked on for many, many years. It is a transcription from a slow movement of a flute sonata. There's a recording I really love by [Wilhelm] Kempff, and I was always looking for that arrangement. I found it when I was taking some German students to Lucerne, Switzerland with our German teacher, and our son David was with me. He was 12 years old. He liked it and wanted me to teach it to him. So I did that, but I also learned it myself. It's just a very touching beautiful piece. It reminds me a lot of “Jesu, Joy of Man’s Desiring,” the same kind of pulsation. It's just a stunning, heavenly peace that I've heard several artists play, and I fell in love with it. I have many thoughts of how I'd like to have it played. Of course, there's many ways to do it, but I'm proud of the way I'm doing it [in this recording]. It is a work that everybody, I think, will like. I knew this composer [Kenji Bunch] when my wife and I taught at Maple Mount Music Festival two decades ago. Kenji Bunch was the artist in residence, and I liked his music very much. When I had my accident with my hand, I had the wonderful fortune of having colleagues and friends from all over the country and other countries donate thousands of dollars for me to commission a new work. It was a brilliant idea by my colleague Susan Day to bring out a new work for me, but after I perform it for the first time, it's open to anybody. What a wonderful gift to me to have added [this concerto] to the pianists’ repertoire. It’s a very attractive piece. I think everybody will really enjoy it. It's lyrical, it's exciting, it's entertaining, it has the kind of rhythmic energy that Bernstein's music has. I wanted to say that I'm very, very grateful for those donors who provided the funds for this concerto. It's not cheap to commission large-scale works. I'm just grateful that I have had this opportunity to perform with the orchestra and to have commissioned this and a few other pieces for left hand alone – so thank you, everybody. I would not have had this opportunity if I didn't have any kind of an accident. So there's lemonade and lemons. I'm very grateful that it didn't happen to one of my students. I was taking a hike with my students - I was over a barbed wire fence, and I don’t to get into the details. But I was glad that happened to me [instead of to a student]. I'm 68 years old now. I have three recordings, I have a wonderful family, I've done a lot professionally, but it would've killed me to have had that [accident] happen to a student. I'm really grateful it happened in my fourth finger because that's the one that's expendable. If God said you lose a finger I'd say please take the fourth. If I'd lost the thumb or the fifth finger or any other digit, it would have been a much bigger deal. I grew up with this Leon Fleisher recording that he used when he won that famous competition [The Queen Elizabeth Piano Competition]. So that's the kind of benchmark that I have for it. I suppose if you would press me to a corner and [make me] say what my favorite composer is - I don't know if I could answer - but all I can say is, I keep coming back to Schubert’s music. This quintet has two cellos in it. It's so very lyrical. Most of Schubert's beauty lies in his lyricism because he is the composer of the lied - over 500 art songs. You can hear that in this work - not just that, but the harmonic relationships that are so luscious and so unusual in this work. When I hear this this piece, if it's the last movement and I'm driving the car, I have to pull over. I can't focus on driving if I hear this piece at the same time! On Sunday, February 17, Classical IPR brings you the Traverse Symphony Orchestra in a live broadcast from Corson Auditorium. Kevin Rhodes conducts Beethoven's Egmont Overture and the Symphony No. 3 "Eroica." The concert features piano soloist Michael Coonrod performing the world premiere of the Concerto for Piano, Left Hand by Kenji Bunch. Listen to Classical IPR's broadcast this Sunday starting at 2:50 p.m. with the concert downbeat at 3 p.m.